During the summer 2016 The Lights On! project organized a competition open to designers, artists and students living in Finland or Estonia to find an innovative piece of jewellery which would be symbolic of the power embedded within historical sites in Finland and Estonia. This competition was won by Salla Viitasalo, the designer of Viitasalla Design, with her ‘Bound Together’ necklace. ‘Bound Together’ necklace comprises of two bronze parts building the main body of the piece and representing the two countries on each side of the Gulf of Finland, Finland and Estonia, bound together by nature like the roots that entwine grasping each other. The piece also wants to give a modern form to the ancient bronze jewellery created in both countries during their history. Together these two pieces form a simple decorative clasp often used in the ancient costume jewellery. Lights On! project seeks to create a joint network of historical tourist attractions in Finland and Estonia. In Finland, the attractions in the spotlight are the Kuusisto Bishop’s Castle ruins, the Raseborg Castle ruins, the Rapola Hill Fort and the Vallisaari Fortress. The attractions in Estonia are the Neeruti Hill Fort, the Varbola Hill Fort, the Lõhavere Fortress and the Keila-Joa Historical Manor Park. The project seeks to encourage people to visit these sites which will hopefully become attractive travel destinations. 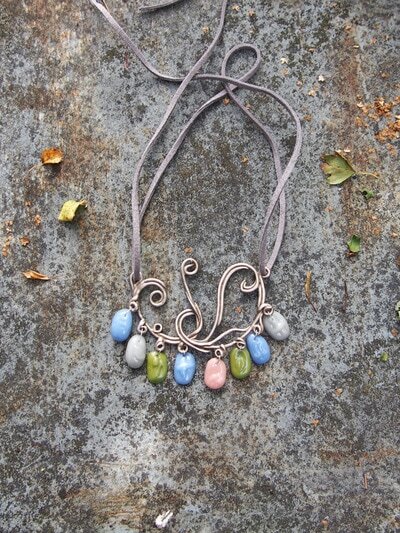 The jewellery piece has been created by hand using the contemporary metal clay and glass clay techniques. In both of these techniques the fine metal or glass powder is mixed with a binder substance and water to create a clay-like mass which can be handled fairly similarly than clay when creating ceramics. After the piece is formed by hand it will enter a kiln process where the binder burns out and the metal sinters or glass melts joining the particles to a solid piece. The process is known for it’s original way of showing the metal clay artist’s personal touch and way of working in the details of the finalized piece – very different from the contemporary mechanically produced jewellery. 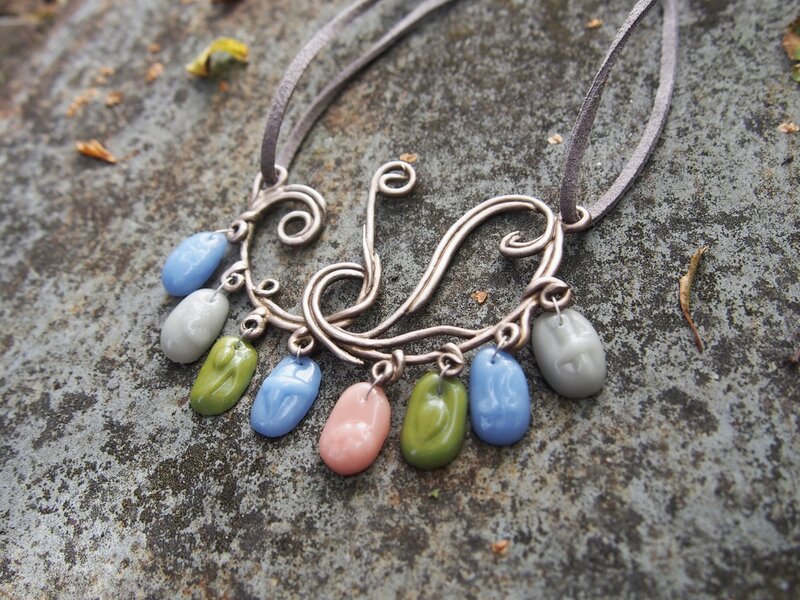 The main piece of the necklace has been created of a pale shade of bronze, the pendants from opal-shade glass in green, grey, blue and rose colours. 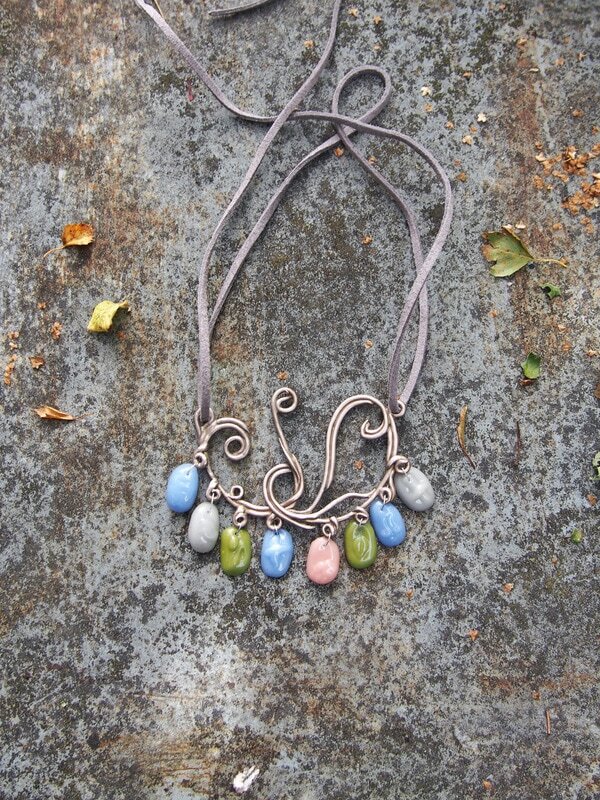 The piece has been joined together with a grey suede necklace. Even if the bronze piece is primarily meant to be worn clasped together, each of the bronze pendants can be worn as separate pendants either with or without the glass pendants. I do plan a lot, I get ideas for jewelry everywhere I go. Sometimes I just play with them in my mind, sometimes I doodle them in my notebook or my virtual notebook on my iPad. Some ideas balance on the edge of my knowledge and skills so I have to ponder on them a lot before executing. I have to get the different phases sorted out, create patterns and support structures and solve some design-related problems. In some cases planning is vital and bad planning usually backfires already in the early stages. These two steel pendants fresh out of the kiln were my previously failed projects – with some experimental carving on the dry stage they turned out quite nice indeed. Today I experimented both on a Art Clay Silver project and making a Hyperlapse video. The clip below shows me carving and connecting two silver parts to a form I found playing with the dry clay pieces. What is the way you pick for your creative projects? Planning or experimenting? I definitely like both. 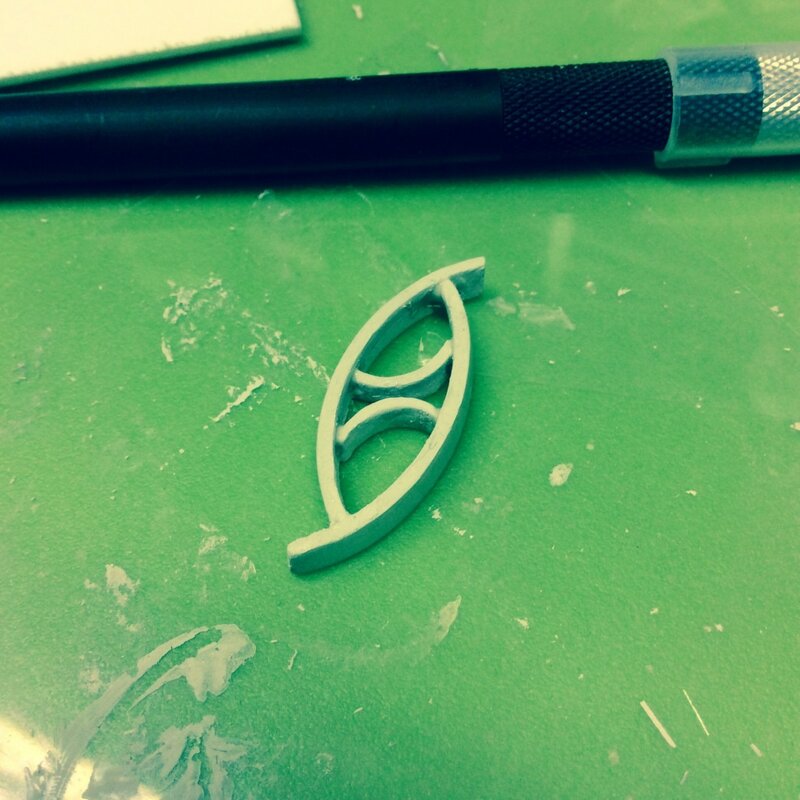 The other night I was creating two simple bands of silver clay for making a pendant. These bands seemed just fine, but I wasn’t careful and I broke one of them shattering it to pieces. Destined to get the work done I cursed for my stupidity and was prepared to rehydrate the pieces as it clearly was beyond repair. Defeated I sat silent for a while stirring at my messy work bench. Then the silence of my mind broke off as my eyes fixed on two other parts of dry clay I had created long time ago. For these two arches I first had a plan but then later realized that they were not fit for it. They had been sitting there and waiting desperately for something new to arise. I started playing with all of those pieces uniting them in various ways and inspiration struck me again. No, it was nothing spectacular but with a bit of clay paste a simple new form was born. It felt like all the pieces were there for a reason and destined to be a part of something else than what I planned all along. This work always seems to be about not feeling good enough, failing miserably and getting caught to sudden challenges in the process of making your plans come real. Life challenges those who have the urge to create. On the path of learning this was a good little reminder. Things tend to have a life of their own and failure can be a step towards something new – if you just remember to have an open mind. My mother tells a story of how I as a child just loved to roll tiny balls of playdough in my fingers – sometimes she could even find me in my bed fallen asleep with my precious playdough pressed tight in my hands. Later on as a pre-teen I remember crafting a series of earrings for my mother of colourful plastic foam sheets which were a novelty at the local crafts store at the time. It felt exhilarating and new ideas just flowed in. Then the ceramics came along. 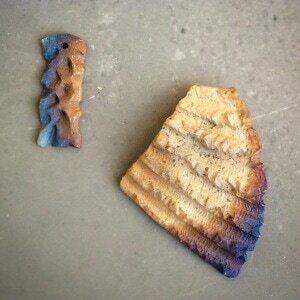 I attended a ceramics workshop as a teenager and oh, how I loved the material. To be able to form clay from ideas into solid three-dimensional objects, it was fantastic and new to me. I continued at the workshop for years creating pottery and sculptures of different forms and sizes. Then came a period when I didn’t have anything to do with ceramics. But I longed for it from time to time and leafed through some course catalogues every now and then. There never seemed to be a suitable time though. Until a few years back when I decided I wanted to take a summer course on ceramics. I went online and searched for suitable courses. I didn’t find any great ones but instead found a course for silver clay. Suddenly I remembered reading about it earlier and after giving it a bit of thought I enrolled to a weekend course. And there it was, the incredible medium I had been waiting for years, this magic compound which could be formed like clay but turned into pure fine silver after a visit to the kiln. I was amazed and thrilled. 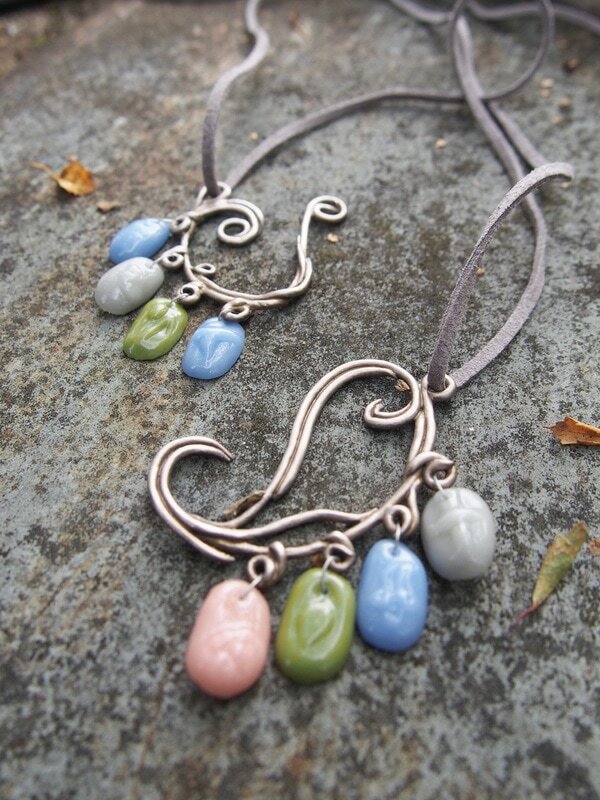 I had to quickly learn more and before I even realized it I had enrolled myself to an Art Clay Silver Instructor course. I wanted to learn things beyond the basics and to learn them well. The course was excellent and led me to a path of continuous exploration. What is perfect with this medium is that you always seem to be able to learn more, experiment and find new ways to work with the clay. To challenge yourself with complicated three dimensional forms and to make valuable unique pieces for yourself and others to wear. I seem to never grow tired to working with metal clay – and I really hope that I won’t either.